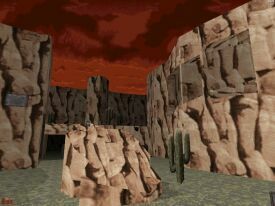 MetHunter's first dukematch release is a medium size canyon map. I'd imagine it's a bit too big for two players but with three to four players it provides fast paced action. The flow is good. For example, to get to the upmost part of the map you get to choose between three routes. Shotgun and chaingun dominate. Freezer frags are rewarded with an Atomic Health but just make sure no one else is around to shatter your Freezer victims. While most of the action is outdoors, there's a small bunker with a few good spots for tripmines. Layout provides some good y-axis action as well and the level looks pretty good with its simple green, brown and red textures.